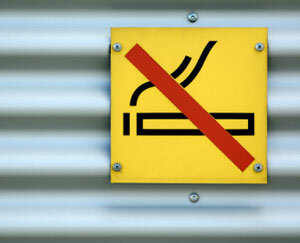 Some treatments to stop smoking are covered by health insurance. Check with your carrier to see. Some products are available both over the counter (behind the pharmacy counter) and with a prescription. Ask your health insurance about whether you need a prescription for coverage or reimbursement. Try, try, and try again. People who successfully quit smoking rarely do so on the first attempt. If you’ve tried before without success, don’t be discouraged. Consider a different quit aid—the nicotine patch instead of gum, or adding in a prescription medication—and evaluate what worked and didn’t work to keep you on track during past attempts to quit. Start with your doctor, nurse, or pharmacist. They can offer invaluable advice and connect you with programs for people trying to quit, including support groups and other resources. Consider taking advantage of these supports, because most people do best when they combine quit-smoking products with behavior change programs. When selecting a product, consider your current medications and health conditions. Consult your doctor or pharmacist if unsure about whether any particular smoking cessation product is safe for you. Use nicotine replacement carefully and follow all package directions. Some people load up on patches, gum, and sprays yet continue to smoke at the same time. This can overload your system with nicotine, resulting in jitters, rapid heart rate, high blood pressure, and trouble sleeping. Some products can be used together, so ask your doctor or pharmacist what’s best for you. What they are: Nicotine patches are similar to an adhesive bandage; you place one on your skin and it releases a constant amount of nicotine into the body while you wear it. They come in different sizes, with larger sizes delivering more nicotine. Why to buy: Nicotine replacement patches are available over the counter or with a prescription, and typically cost less per day than a pack of cigarettes. Patches are convenient and easy to use and can be removed during sleep to lessen the likelihood of insomnia. Due to the constant, slow release of nicotine, you are not likely to develop a craving for a patch; it doesn’t provide the intense delivery of a cigarette. Things to consider: Unlike smoking, which delivers a large dose of nicotine to your body within seconds, nicotine from a patch can take up to three hours to get into the body. For this reason, putting on a patch when a cigarette craving strikes is not effective. The nicotine patch reduces smoking withdrawal symptoms, such as lack of concentration and irritability. What they are: Nicotine replacement gums are available over the counter or with a prescription and typically cost much less per day than a pack of cigarettes. Gum comes in different strengths to provide the amount of nicotine you need, based on your previous smoking habits. Why to buy: Gums are relatively convenient and easy to use, although you must remember to keep yours with you, because it must be chewed frequently to deliver enough nicotine to manage cravings. Though it cannot get nicotine into your body quite as quickly as a cigarette, gum delivers nicotine within minutes, which is far faster than a patch. Things to consider: Nicotine gum should not be used with cigarettes and you should not eat or drink for 15 minutes before or while using the gum. To chew enough gum to quell cravings, most people need between 15 and 30 pieces per day, chewed off and on for about 30 minutes. Nicotine gum should not be chewed continuously like regular gum and should never be swallowed. It is chewed a few times to break it down and then placed in between your gum and cheek for 10 or 15 minutes, chewed again for a bit, then put back into the cheek. Continuous chewing may cause stomachaches. What they are: Nicotine replacement lozenges and lollipops are available over the counter or with a prescription. They may cost a bit more than patches or gum, but typically less than a pack of cigarettes. Lozenges and lollipops come in different strengths to provide the amount of nicotine you need, based on your previous smoking habits. Why to buy: Some people don’t like to chew gum and prefer sucking on a candy to replace nicotine when quitting smoking. These products are relatively convenient, but you must remember to keep them on hand to use throughout the day. Lozenges and lollipops deliver nicotine within a few minutes, similar to gum. Things to consider: Nicotine lozenges and lollipops should not be used with cigarettes and you should not eat or drink for 15 minutes before or while they are in your mouth. Nicotine lozenges and lollipops should not be chewed or swallowed as this can lead to heartburn and stomachaches. Some people find these products irritate the mouth and throat. What they are: These products deliver nicotine through a spray into the nose or are inhaled through the mouth. They are available by prescription only. Why to buy: Nicotine nasal sprays and inhalers deliver nicotine as quickly as a cigarette, making them particularly helpful for people who are highly dependent on tobacco. For the person who smokes more than a pack of cigarettes per day, these products may be very effective. Things to consider: You need a prescription to obtain a nicotine spray or inhaler. Sprays cost about the same as gums and patches, but inhalers can be more expensive. They may be covered by insurance, which can help reduce the cost. What they are: Two different non-nicotine prescription medications may help people quit smoking by reducing the desire to smoke.. These are bupropion (brand name Zyban) and varenicline (brand name Chantix). Why to buy: These medications may significantly increase the quit smoking success rate beyond using nicotine replacement alone. They can be used in conjunction with nicotine replacement, further increasing success rates of quitting. Things to consider: Like all prescription medications, these drugs can have side effects. Many people tolerate them well, but some people experience very serious side effects, particularly from varenicline, which in some people causes hostility, agitation, anger, aggression, depressed mood, anxiety, paranoia, confusion, mania, or suicidal thoughts or actions. These can develop when a person begins taking the medication, after several weeks of treatment, or after stopping the varenicline. Insurance may not cover the cost of these medications.